"It's a very great honor," Trump said to the leader of the Roman Catholic Church after they were seated in the pope's private study. After the private meeting between the two men, they were joined briefly by Trump's wife Melania and members of the U.S. delegation. That encounter included an exchange of gifts. A Vatican statement said the pope had a "cordial" discussion with the U.S. president. The Vatican also said it hopes the two sides can work together on "health care, education and assistance to immigrants." Earlier, reporters asked Pope Francis about his expectations for the meeting with Trump. The pope reacted by saying he "never, ever wanted to make a judgment without hearing the person." The pope said anyone who thinks of building walls instead of bridges "is not Christian," a comment that Trump called "disgraceful." "One offers peace of dialogue, the other security of arms," he said on Twitter. He appeared to be talking about the $110 billion weapons deal the U.S. president signed with Saudi Arabia days ago. Later, the Trump administration described the discussion between the leaders in a statement. It said they both shared fundamental values "to promote human rights, combat human suffering and protect religious freedom." Opinions about the U.S. president's visit on Wednesday were mixed on the streets of Rome. 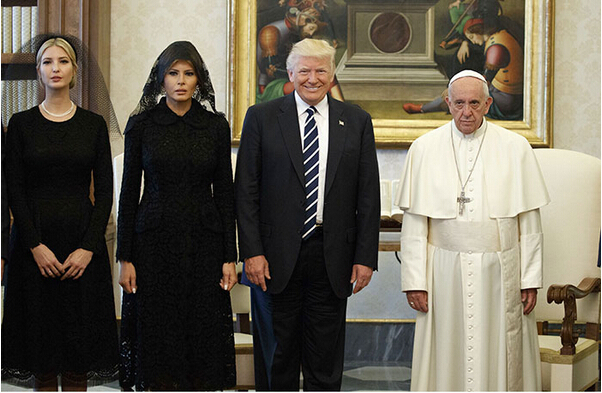 An American Catholic named Eva was happy that the meeting between Trump and the pope had even taken place. "I think it's fabulous that the pope decided to meet with Trump." Near the official home of Italy's president, a 19-year-old Canadian man named Daniel and his girlfriend talked about the bombing in Manchester, England. They also expressed fears of terrorism in Europe. Daniel said he hoped Trump's visit would help make Europe stronger. "We hope he can bring some more stability because Europe has been quite unstable for the past year or so and even more than that. So we can hope he can bring more stability while also keeping things peaceful and not escalating things too much." We don't have enough facts to make a judgment. In the treaty both sides pledge to respect human rights. We would not criticise religion or religious freedom. 1.The Vatican also said it hopes the two sides can work together on "health care, education and assistance to immigrants." They live and work together in complete equality and brotherhood. They seemed able to work together very efficiently. 2.She also said she hoped the meeting gave the men the chance to make peace. The leaders of the two nations decided to make peace. It's up to you to make peace between me and sonny.